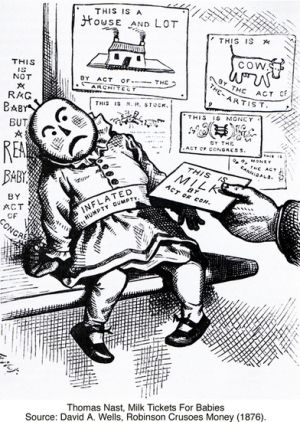 Michael O’Malley explains how Thomas Nast’s 1876 political cartoon lampooning paper money provides an opportunity for students to explore public debate about economic transformations during the Gilded Age. Source: David A. Wells, Robinson Crusoes Money (1876). I’ve always liked this image, an illustration done by political cartoonist Thomas Nast for a book called Robinson Crusoe’s Money, written by David A. Wells in 1876. The cartoon captures an important transition in American culture, a new way of thinking about exchange and money. Americans had used paper money to finance the Civil War—the government simply printed money and insisted that you had to take it in payment. It was “legal tender” for all debts. For Lincoln and his allies, it was better than raising taxes, but for more conservative Americans paper money was an immoral fraud, an act of wishful thinking. “Gold Bugs” wanted to burn all the paper greenbacks and return to gold as money. But it’s a very backward looking, reactionary cartoon. “This is a cow, by act of the artist.” Well, it would certainly be possible that if an artist painted a really fine cow, the painted cow would be worth more than the real cow. And in the commodities markets of New York and Chicago, traders regularly bought and sold beef and pork “futures”—not actual existing cows, but paper representations of cows, bets on what cows would be worth in the future. The buyers and sellers would never see the actual cows, and in fact in the futures market the actual cows did not yet exist; they were just paper. Similarly, in the marketplace a piece of paper, a deed, can represent a house and lot, can “be” a house and lot perfectly well. Anyone with money could buy a house without ever even seeing the house—the paper, the deed, would to all intent and purposes “be” the house. The cartoon suggests how the American economy was becoming more “virtual” in the Gilded Age, and how uncomfortable that made people feel. In the cartoon Nast imagines back to the world of barter, a world where a bushel of apples was a physical bushel of apples you traded for a real sack of wheat, not the world where a bushel of apples was a paper symbol traded by strangers who gave you other paper symbols in return. He’s upset about the way the sign, the symbol, seems to be confused with the thing it symbolizes. But the economy of his day was moving more and more towards the virtual, and today most people have no idea at all what money “really is.” We use it every day, we use credit cards, and there is no “real money,” just blips of data.